Get 2 homes for the price of 1! 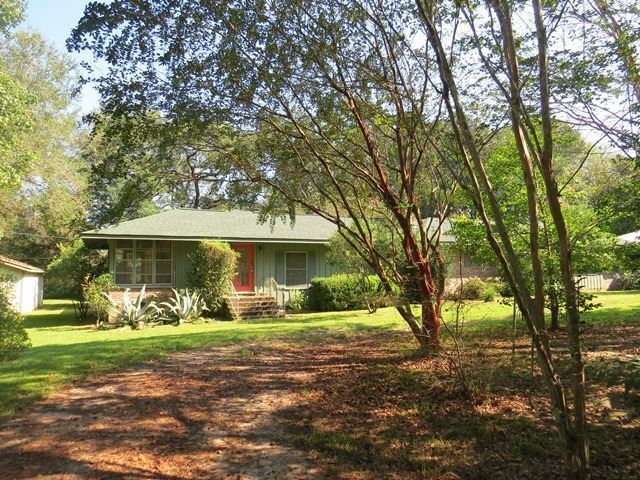 Super sturdy VINTAGE RANCH HOME with a contemporary guest house directly on the Magnolia River. The main house is a 3/2.5 and is 2465 sq. ft. has an enormous farm kitchen with loft ceiling and open beams. Primarily hardwood floors throughout. 2 fireplaces - wood burning in the family room and gas in the master bedroom. New roof in 2014, screened sleeping porch on west wing, covered carport with metal roof, atrium area that opens onto patio, water ponds (Once stocked with Koi), septic system, large garage with storage. The GUEST HOUSE, built in 2001, features 2 bedrooms and 1 bath plus a loft, HUGE screened porch and HUGE deck overlooking the river. BOAT SLIPS with lift underneath the guest house. 1001 sq. ft. Lush landscaping - while a bit over-grown, offers a gardener&apos;s paradise. Consider this: Perfect location for an Artist-in-Residence program. Provide an artist the opportunity to live and work outside of their usual environment. Provide them with time to reflect, research, and be creative. Step back in time and let the River speak to them...or to you! Directions: Hwy 98 Towards Fairhope - Turn South On Cty. Rd. 49, Pass Jesse&apos;s Restaurant And Cross Over The River. Turn Right At The 2nd Street Past The River - Cotton Stocking Lane. This Property Is The The 3rd On The Right Down The Lane.